Since 1955, IAALD has produced a peer reviewed journal reporting on developments in agricultural information and its management. 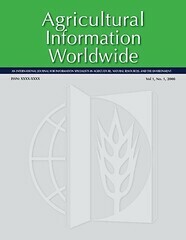 In early 2008, the journal was re-launched under the title Agricultural Information Worldwide (AIW), a peer-reviewed journal that publishes high quality articles on all aspects of the agricultural information profession. Priority is given to practical and applied topics, such as but not limited to best practices. Research articles with practical applications will are also considered for publication. Subject coverage includes articles on information, knowledge and communication activities related to the applied life sciences, including agriculture, food from production to marketing, natural resources, fish and wildlife, environment, and agricultural extension and education. If you are interested in submitting an article, serve as a peer reviewer or on the editorial committee, please contact us at the following email address: info@iaald.org. Johannes Keizer (FAO) - Knowledge and Capacity for Development, Office of Knowledge Exchange, Research and Extension, Food and Agriculture Organization of the United Nations. Tomaž Bartol (Slovenia) – Chair of Information Science and Head of the Slovenian National Agris Centre at the University of Ljubjana.